With great fanfare, Deputy Attorney General Rod Rosenstein on Friday released a 29-page indictment, a byproduct of the ongoing investigation by special counsel Robert Mueller into Russian meddling in the 2016 presidential election. Ostensibly, this indictment cemented the government’s case against the Russians and punched a hole in the arguments of those, like President Trump, who have been labeling Mueller’s investigation a “witch hunt.” This, of course, is precisely what Rosenstein and Mueller hoped to achieve through their carefully timed, and even more carefully scripted, indictment. The indictment was made public at a time when the FBI is under increasing scrutiny for the appearance of strong anti-Trump bias on the part of some of its senior agents. This purported bias in turn generated rational concerns on the part of the president’s supporters that it possibly influenced decisions related to investigations being conducted by the FBI into allegations of collusion between persons affiliated with the campaign of then-Republican candidate Trump and the Russian government. The goal of this alleged collusion was to interfere in the American electoral processes and confer Trump an advantage against his Democratic rival, Hillary Clinton. It also comes on the heels of a concerted effort on the part of the president and his political supporters to denigrate the investigation of Mueller and, by extension, the judgment and character of Rosenstein, who, since the recusal of Attorney General Jeff Sessions from the Russian investigation, has been giving Mueller his marching orders. Indeed, several conservative members of the House of Representatives are mulling the impeachment of Rosenstein,claiming he is refusing to cooperate with Congress by denying them access to documents related to the investigation that certain members of Congress, at least, deem relevant to their constitutionally mandated oversight function. While the impeachment of Rosenstein is highly unlikely and the likelihood of the FBI being found guilty of its investigations being corrupted by individual bias is equally slim, in the world of politics, perception creates its own reality and the Mueller investigation had been taking a public beating for some time. By releasing an indictment predicated upon the operating assertion that 12 named Russian military intelligence officers orchestrated a series of cyberattacks that resulted in information being stolen from computer servers belonging to the Democratic Party, and then facilitated the release of this information in a manner designed to do damage to the candidacy of Clinton, Rosenstein sought to silence once and for all the voices that have attacked him, along with the Department of Justice, the FBI and the Mueller investigation, as a participant in a partisan plot against the president. There is one major problem with the indictment, however: It doesn’t prove that which it asserts. True, it provides a compelling narrative that reads like a spy novel, and there is no doubt in my mind that many of the technical details related to the timing and functioning of the malware described within are accurate. But the leap of logic that takes the reader from the inner workings of the servers of the Democratic Party to the offices of Russian intelligence officers in Moscow is not backed up by anything that demonstrates how these connections were made. That’s the point of an indictment, however—it doesn’t exist to provide evidence beyond a reasonable doubt, but rather to provide only enough information to demonstrate probable cause. No one would, or could, be convicted at trial from the information contained in the indictment alone. For that to happen, the government would have to produce the specific evidence linking the hacks to the named Russians, and provide details on how this evidence was collected, and by whom. In short, the government would have to be willing to reveal some of the most sensitive sources and methods of intelligence collection by the U.S. intelligence community and expose, and therefore ruin, the careers of those who collected this information. This is something the government has never been willing to do, and there is much doubt that if, for some odd reason, the Russians agreed to send one or more of these named intelligence officers to the United States to answer the indictment, this indictment would ever go to trial. It simply couldn’t survive the discovery to which any competent defense would subject the government’s assertions. Robert Mueller knew this when he drafted the indictment, and Rob Rosenstein knew this when he presented it to the public. The assertions set forth in the indictment, while cloaked in the trappings of American justice, have nothing to do with actual justice or the rule of law; they cannot, and will never, be proved in a court of law. However, by releasing them in a manner that suggests that the government is willing to proceed to trial, a perception is created that implies that they can withstand the scrutiny necessary to prevail at trial. And as we know, perception is its own reality. 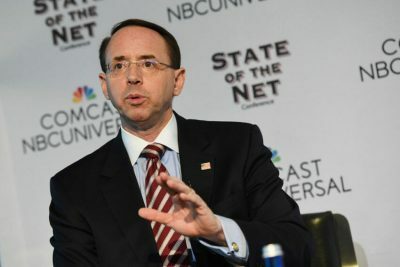 Despite Rosenstein’s assertions to the contrary, the decision to release the indictment of the 12 named Russian military intelligence officers was an act of partisan warfare designed to tip the scale of public opinion against the supporters of President Trump, and in favor of those who oppose him politically, Democrat and Republican alike. Based upon the media coverage since Rosenstein’s press conference, it appears that in this he has been wildly successful. But is the indictment factually correct? The biggest clue that Mueller and Rosenstein have crafted a criminal espionage narrative from whole cloth comes from none other than the very intelligence agency whose work would preclude Rosenstein’s indictment from ever going to trial: the National Security Agency. In June 2017 the online investigative journal The Intercept referenced a highly classified document from the NSA titled “Spear-Phishing Campaign TTPs Used Against U.S. And Foreign Government Political Entities.” It’s a highly technical document, derived from collection sources and methods the NSA has classified at the Top Secret/SI (i.e., Special Intelligence) level. This document was meant for internal consumption, not public release. As such, the drafters could be honest about what they knew and what they didn’t know—unlike those in the Mueller investigation who drafted the aforementioned indictment. A cursory comparison of the leaked NSA document and the indictment presented by Rosenstein suggests that the events described in Count 11 of the indictment pertaining to an effort to penetrate state and county election offices responsible for administering the 2016 U.S. presidential election are precisely the events captured in the NSA document. While the indictment links the identity of a named Russian intelligence officer, Anatoliy Sergeyevich Kovalev, to specific actions detailed therein, the NSA document is much more circumspect. In a diagram supporting the text report, the NSA document specifically states that the organizational ties between the unnamed operators involved in the actions described and an organizational entity, Unit 74455, affiliated with Russian military intelligence is a product of the judgment of an analyst and not fact. If we take this piece of information to its logical conclusion, then the Mueller indictment has taken detailed data related to hacking operations directed against various American political entities and shoehorned it into what amounts to little more than the organizational chart of a military intelligence unit assessed—but not known—to have overseen the operations described. This is a far cry from the kind of incontrovertible proof that Mueller’s team suggests exists to support its indictment of the 12 named Russian intelligence officers. If this is indeed the case, then the indictment, as presented, is a politically motivated fraud. Mueller doesn’t know the identities of those involved in the hacking operations he describes—because the intelligence analysts who put the case together don’t know those names. If this case were to go to trial, the indictment would be dismissed in the preliminary hearing phase for insufficient evidence, even if the government were willing to lay out the totality of its case—which, because of classification reasons, it would never do. But the purpose of the indictment wasn’t to bring to justice the perpetrators of a crime against the American people; it was to manipulate public opinion. The timing of the release of the Mueller indictment unleashed a storm of political backlash directed at President Trump, and specifically at his scheduled July 16 summit with Russian President Vladimir Putin in Helsinki. This summit was never popular with the president’s political opponents, given the current state of affairs between Russia and the U.S., dominated as they are by events in Syria and Ukraine, perceived Russian threats against the northern flank of NATO, allegations of election meddling in the U.S. and Europe, and Russia’s nuclear arsenal. On that last point, critics claim Russia’s arsenal is irresponsibly expanding, operated in violation of existing arms control agreements, and is being used to underpin foreign policy objectives through the use of nuclear blackmail. President Trump has publicly stated that it is his fervent desire that relations with Russia can be improved and that he views the Helsinki summit as an appropriate venue for initiating a process that could facilitate such an outcome. It is the president’s sole prerogative to formulate and implement foreign and national security policy on behalf of the American people. While his political critics are free to criticize this policy, they cannot undermine it without running afoul of sedition laws. Rosenstein, by the timing and content of the indictment he publicly released Friday, committed an act that undermined the president of the United States’ ability to conduct critical affairs of state—in this case, a summit with a foreign leader the outcome of which could impact global nuclear nonproliferation policy. The hue and cry among the president’s political foes for him to cancel the summit with Putin—or, failing that, to use the summit to confront the Russian leader with the indictment—is a direct result of Rosenstein’s decision to release the Mueller indictment when he did and how he did. Through its content, the indictment was designed to shape public opinion against Russia. This indictment, by any other name, is a political act, and should be treated as such by the American people and the media. Scott Ritter spent more than a dozen years in the intelligence field, beginning in 1985 as a ground intelligence officer with the US Marine Corps, where he served with the Marine Corps component of the Rapid Deployment Force at the Brigade and Battalion level.